When in Manila, we can never go wrong with waffles and pancakes in the morning. Just thinking of fluffy pancakes topped with an assortment of fruits and covered with butter and maple syrup can make anyone’s mouth water. 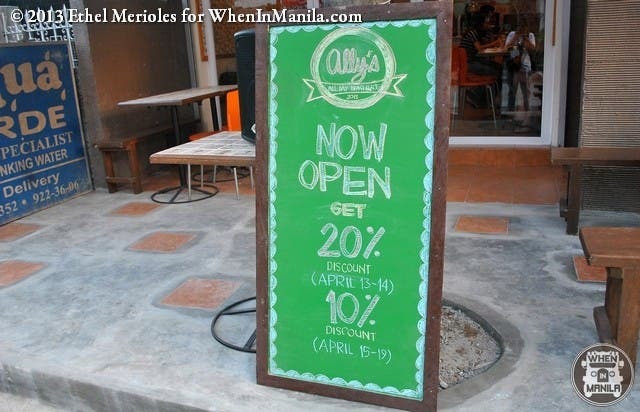 Ally’s All-Day Breakfast Place, the brainchild of young entrepreneur and food enthusiast Alyssah Mingo and her fiancé Josiah Albelda, offers affordable make-your-own waffles and pancakes as well as an assortment of budget meals for rice and pasta lovers. The breakfast joint is currently on a soft opening week promotion where diners receive 10% discount from today til Friday! Cozy and inviting, Ally’s All-Day Breakfast Place is one quaint, little diner where the sun always shines, the folks lively and the food served hot. “Keep Calm and Hakuna Matata” What a wonderful phrase. The place is certainly ready to accommodate plenty of guests! Fantastic food finds on the next page. Snickers Pie from the Happy Monster: TAKE MY MONEY NOW!